Looking good! I started on my piece today too and have got as far as cutting out and fusing on the shapes for one little birdie. I'm also planning on handstitching, as I still have not got the hang of freemotion sewing! There were so many lovely pictures to choose from, it was really hard to pick just one! 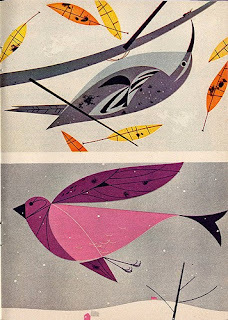 I've ordered a book of Charley Harper postcards from amazon as well, so I may end up making more than one piece. Can't wait to see everyone's progress!